Deeply marked into the foam, the markings have been filled with resin. Very unusual. This board's history is a mystery. In Australia this design had a short but well publicised life circa 1971 - 1972. Following the experimentation with the Twin fin 1, several designers used variations of tri-fin configurations. The rail fins were usually small and long based, the inside often foiled flat. Position varied enomously from behind to well in front of the central fin. This early experimentation established the principle that pocentral fin would stiffen the board and make it track, while a position in front of the fin would loosen up the board and make it msitioning behind the ore manourvable. The Tri fin was to reach its peak with the development of Simon Anderson's Thruster (1981) design, placing three similar fins at the tail extemities to maximize manouvreability in small waves. It was subsequently found to superior to all previous designs..
Jock Sutherland, Bill Hamilton and Jeff Hakman riding Plastic Fantastic boards. Burleigh Heads (second last sequence) in. Ric Neilson : Blue bottom/red spray deck Tri fin - central wood veneer fin and two long base keel fins on the rails. Jeff Hackman : Offset two tone, white/orange, Tri fin - two long base keel fins on the rails. Unknown : standard Bonzer design, seen laying on grass. Reno Aberilla? on the beach at Rocky Point? Hawaii with Terry Fitzgerald, latter sequences. Surfer magazine Volume 13 Number 3 August 1971. Advertisement: Hawaii Surf Products :Ti Fin Kit, page ? "The tri fin kit includes easy installation instructions and everything you need to convert your old single fin into a new tri fin instantly. Placement of fins can be changed from day to day as conditions demand. 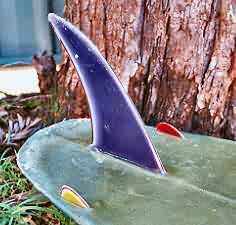 The fins are available in red, blue, purple, yellow, green and white. Do your board a favor. send $3.00 + 50c for post and handling. Hawaii Surf Products, Box 394 Hermosa Beach, Ca, 93254." Also note the advertisement below is for the Surf Strap, an early version of the legrope/surfleash that mounted on the nose of the board and attached to the riders wrist. Article: Mike Davis : Design Through Development. 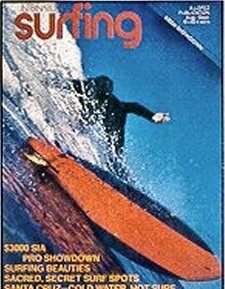 Surfing World magazine Vol 16 # 1 1972 . Deck is good except fot some staining, bottom is poor with the foam sunk below the stringer. Tri fin, centre fin in box, circa 1972.